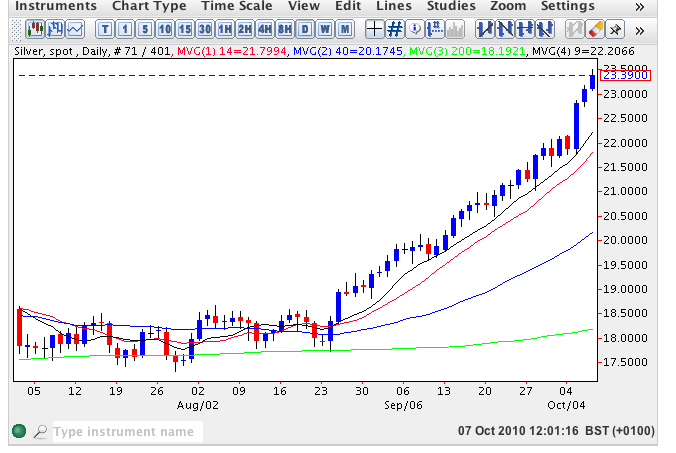 Spot silver climbed higher once again yesterday building on Tuesday’s strong gains for the metal and ended the silver trading session as a modest up candle which did manage to breach the $23 per ounce price handle, reaching an intra day high of $23.113 per ounce. This bullish momentum has spilled over into today’s silver trading session with the commodity trading higher once again, and at time of writing is at $23.38 per ounce, having initially breached the $23.50 price point earlier in the session. This upwards surge continues to find strong support from both the 9 and 14 day averages, with any intra day pullback being fully supported by the former. In addition the 40 day average is now sloping sharply higher and with the 200 average gently inclining upwards, all this is adding to the positive sentiment for the industrial metal at present. Neither the weekly nor the monthly charts give any signal that this trend is likely to come to an end soon, and indeed present an even rosier picture for the longer term. So at present we can expect silver to continue higher until we see a short term reversal signal on the daily chart which will no doubt trigger a bout of profit taking in due course.